Most of us have dabbled in a little high school French, but competence at personal introductions seems a little redundant when it comes to decoding a high-end menu. 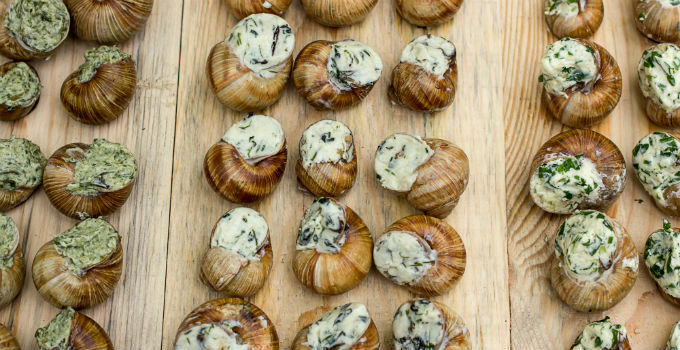 You may remember the familiar escargot, and everyone of course knows croissant, (though possibly can’t pronounce it), but as soon as one is confronted with sous vide, ones meager French starts to wane. Pain au/aux simply means ‘bread with,’ and is pronounced like ‘pahn-oh’ with a soft n (basically, don’t say ‘payne auxe’ as it’s spelt). You’ll commonly see it as pain au chocolat (chocolate croissant), pain au raisins (raisin scroll), pain au levain (sourdough bread), and pain au bananes (banana bread). A coulis is a thick sauce made from pureed or strained vegetables or fruit. A vegetable coulis may be found in meat and vegetable dishes, while a fruit coulis is used in desserts and some breakfasts. Berry coulis is particularly popular! This is essentially the French term for green beans. Haricot vert are long and thin, with a more complex flavour than standard homegrown green beans. Foie gras is the ‘fat liver’ sourced from a duck or goose. Generally, the liver will have been specially fattened through a particular diet, and it is a well-known French delicacy. The flavour should be rich, buttery and delicate, and served as an accompaniment to another food item or on its own as a mouse, parfait, or pâté.